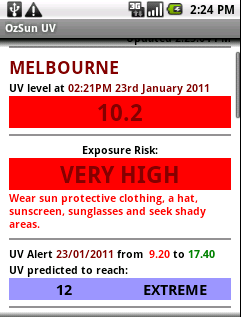 BE AWARE AND PROTECT YOURSELF FROM OVER-EXPOSURE TO SUN UV RADIATION IN AUSTRALIA !! *** ATTENTION: This application is specific to Australia. In locations other than Australia it is made available merely for convenience of international users who work, study or visit Australia. 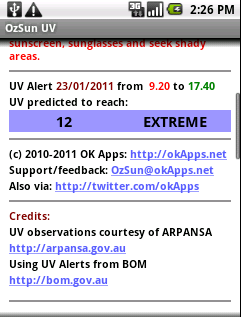 'OzSun UV' app fetches, consolidates and displays in a convenient colour-coded visual way the current actual real-time observed UV levels data available courtesy of Australian Radiation Protection and Nuclear Safety Agency (ARPANSA) and the daily UV (aka 'SunSmart') alerts as issued to the public by Australian Bureau of Meteorology (BOM) based on forecasts. 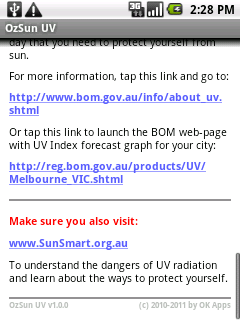 In addition, the app also provides shortcut links to relevant public web pages of these and other relevant agencies, where more information about UV levels for the user’s selected city can be found (accompanied by public education materials regarding sun UV exposure risks and protective measures). 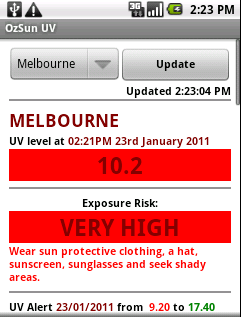 The app uses the same international colour coding for UV index levels as established by the World health Organization (WHO) and adopted by the above mentioned Australian agencies as well. 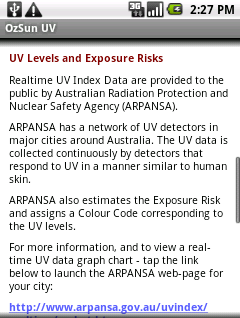 UV observations courtesy of ARPANSA (http://www.arpansa.gov.au/uvindex/realtime/xmlrt.htm#Disclaimer). 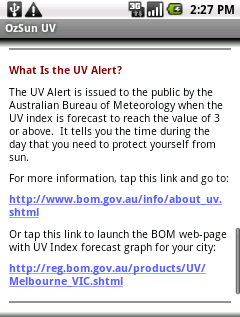 Using UV alerts from BOM (http://www.bom.gov.au/info/about_uv.shtml). to submit queries, feedback and suggestions in regards to this app.